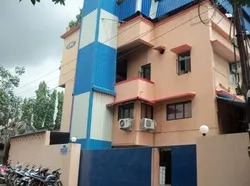 Established in the year 1971, we, “Chem Verse Consultants India Private Limited” are a reputed organization engaged in manufacturing, supplying, trading, importing and exporting a superior quality gamut of Industrial Lubricants & Chemicals and Electrical Products. All the products in our catalog are widely appreciated in the market and are highly preferred to be used in varied automotive, printing, pharmaceutical & food, plastic, engineering, mining and steel industries. The offered range is specifically formulated by the industry experts utilizing premium grade factor inputs and sophisticated engineering technology. Owing to these reasons, our products deliver optimum quality and reliable performance at the customer's end. 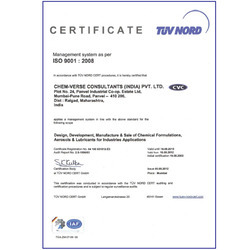 Being a quality centric firm, we procure all the raw material from the certified vendors of the market and maintain the international quality standards throughout the manufacturing process. We have built an ultramodern infrastructure at Mumbai (Maharashtra, India) for carrying out the extensive business operations. It is sprawled across a wide area and well installed with all the modern facilities and upgraded machinery. Our unit comprises of a quality testing unit for checking the entire manufactured range against various parameters before delivering in the market. 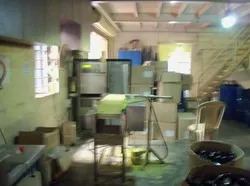 In addition, our warehousing unit is equipped with modern management system and is spacious enough to store the bulk products safely and in a systematic manner. All over India including Vietnam, Sri lanka, Egypt, Bangladesh, Mauritius, Thailand, Turkey, Indonesia, Tehran, Nepal etc. Under the valuable leadership of our director, 'Mr. N.C. Mavani', we have been able to expand our business across the globe. His commendable knowledge, fascinating business decisions, motivating persona and transparent business dealings have helped us in winning the trusts of the customers and forging further dealings, thus increased profits. We are backed by a highly qualified and experienced team of experts, who have been the driving force behind the successful business operations. All the members of the team are selected by following a strict recruitment procedure, which evaluates their knowledge and skills, to get the best in the industry. The team comprises of engineers, quality inspectors, administrators, sales & marketing executives, skilled & semi-skilled workforce. These professionals remain in close contact with the clients to know their exact requirements and accordingly deliver the products to them. We frequently conduct several seminars and trainings to enhance the skills of our personnel and keeping them updated with the modern technology and latest trends.